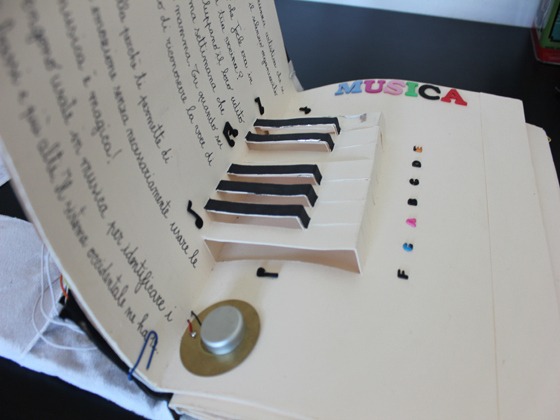 Here’s a cool little project by Antonella Nonnis: a pop-up book complete with a working piano keyboard. It’s constructed from paper and as you can see from the picture it’s not very sturdy or portable. Even so, it’s a great project and can surely have boosted understanding of how these electronics work. It features capacitive touch sensors on the back of the pages, with copper foil strips serving as flexible traces, moving the connections past the binding and allowing them to be jumpered to the pair of Arduino boards. Take a look at the video below to see a time-lapse side-on view of how the instrument was constructed.